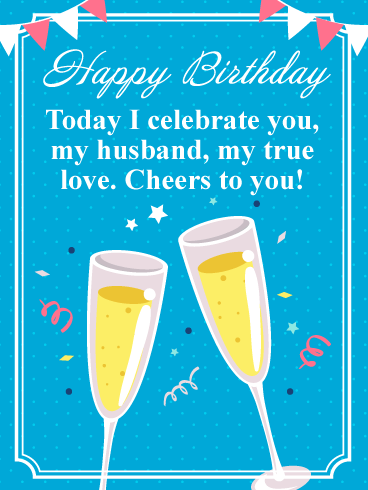 This charming card with whimsical ties decorating the background brings with it a meaningful message, letting your husband know, on his birthday, the many important roles he plays in your life. 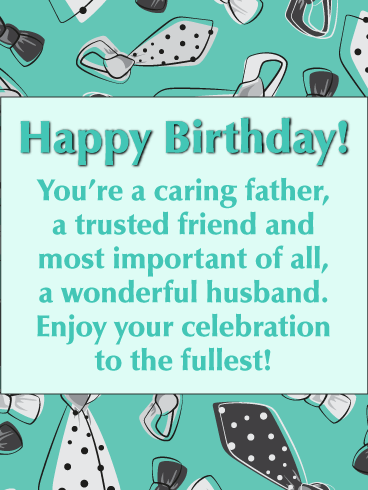 From caring father to a trusted friend to the wonderful man you married, he is special in a lot of ways and he deserves to celebrate to the fullest! 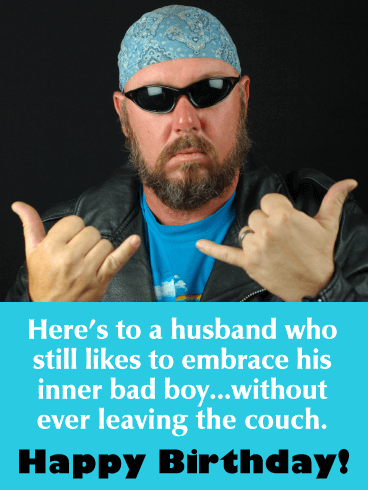 This hysterical birthday card for your husband features a bad biker dude, complete with black shades and a bandana. It’s a chance to celebrate that edgy side of him that he still likes to embrace, even if his activity of choice these days is lounging on the couch! It’s a great way to make him laugh while wishing him another year of being the cool dude he’s always been. Superheroes come in all shapes and sizes…and they have many different strengths. Move over Superman, Batman and Spider-Man because your husband is one caped crusader with skills that may not seem very special, but they are to you. So on his birthday, send this card worthy of lots of laughs for the man who is number one to you every day in so many ways. Your husband holds a special place in your heart. Wish him a happy birthday with this one-of-a-kind card. 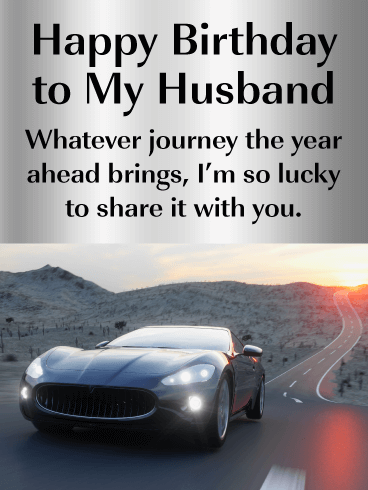 Featuring a sleek black sports car to symbolize the journey ahead, it’s the perfect way to let him know that you love being his passenger in life and look forward to your next adventure together. A young couple walks hand in hand, a heart between their interlocked hands. 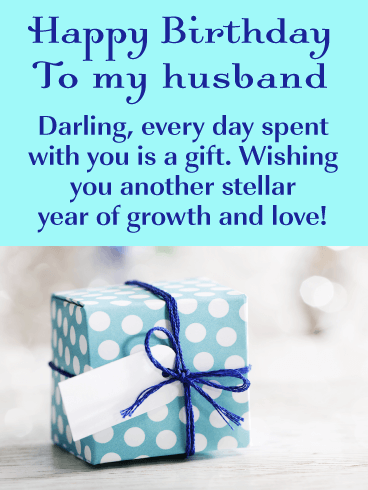 What a wonderful way to remind your husband how much you love him, today and always. 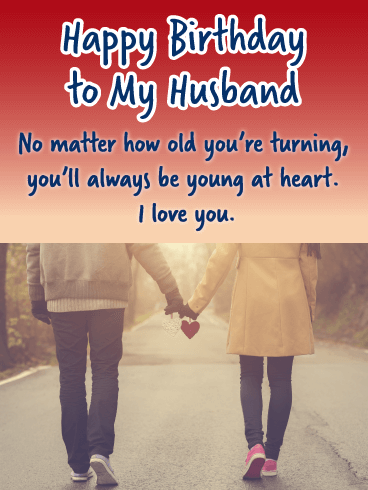 This heartfelt birthday card is also a great opportunity to let him know that no matter what age he’s turning this year, he’ll always be young at heart. 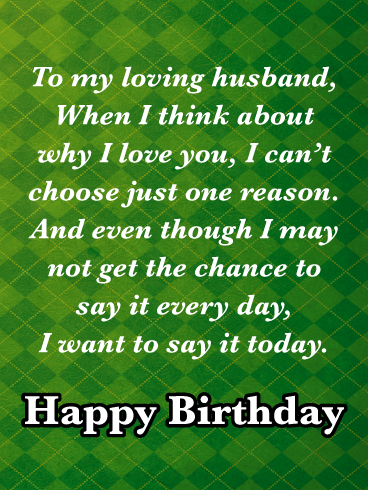 A rich green plaid background brings a colorful touch to this birthday card for your husband. More importantly, it lets your words take center stage. 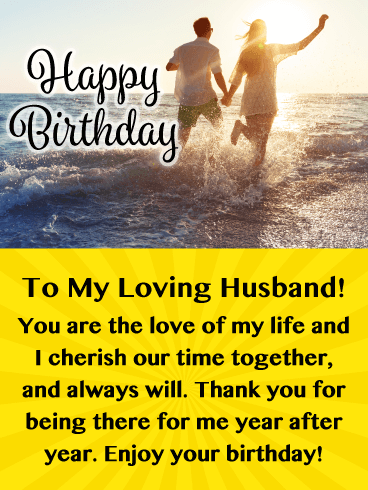 The heartfelt message lets him know that there are so many reasons why you love him, and even though you may not say it every day, on this one special day, you want to remind him of just how you feel while making him feel very special. Two hearts are hung on a line together, as the sun sets in the background. It’s a wonderful expression of the unbreakable bond you share with your husband. And what better time to let him know that on his birthday. 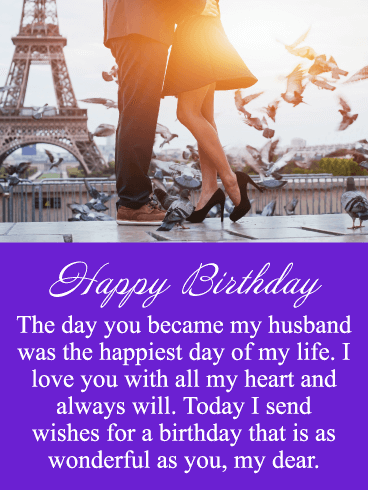 Remind him he’s the one you love, yesterday, today and always, with this touching greeting to make him feel remembered as you celebrate him and all that he does. Have your beloved rolling on the floor laughing their rack (as in antlers!) off with the Deerest Friend Funny Birthday Card. 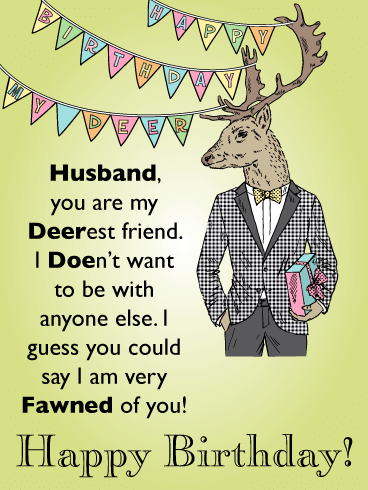 This Happy Birthday card has not one, not two, but three hilarious deer themed puns in the message. Guaranteed to tickle your husband’s funny bone when he reads it! If he is a fan of puns he might find these jokes to be quite…Staggering! Don’t go bacon his heart, this birthday, surprise your sweetie pie husband with our breakfast themed card! Sizzling, crispy bacon slices alongside perfectly sunny-side up fried eggs will have him drooling! We threw in a few good jokes to keep him laughing on his big day too! 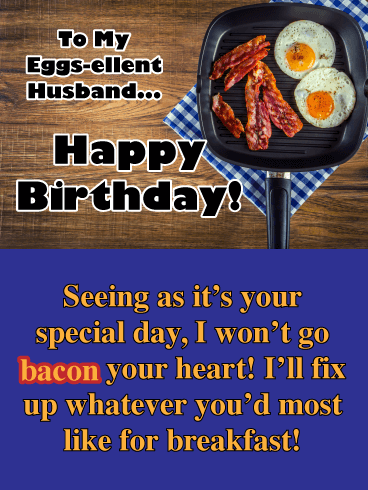 Send the I Won’t Go Bacon Your Heart Funny Birthday Card to your Eggsellent husband to score major brownie points! Your husband, that charming practical jokester. 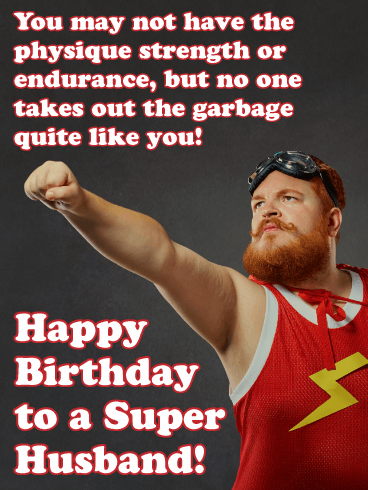 For his birthday you need a funny card worthy of his epic sense of humor! 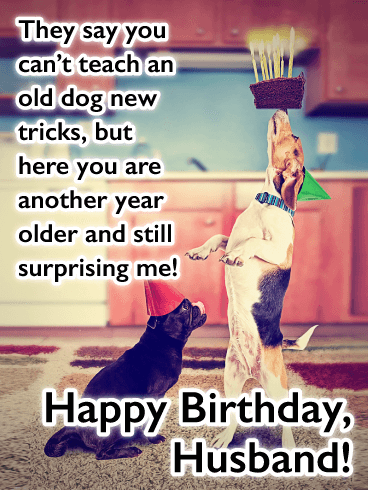 Send that awesome man of yours the Old Dog, New Tricks Happy Birthday Card with this silly beagle and pug dog combo! The little pug looks on while the beagle balances a slice of cake loaded with birthday candles upon his nose! 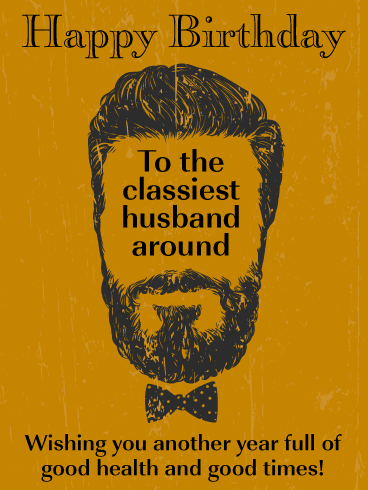 Your husband is the tops, number one, the best, your superhero. You love him so much! 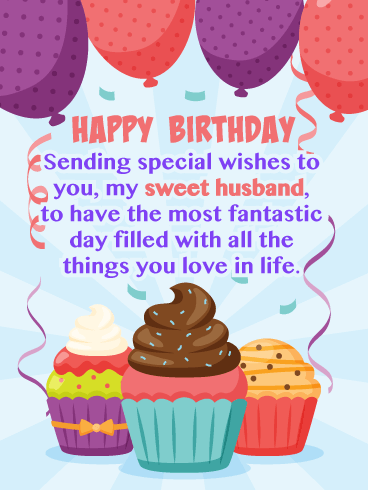 Now send your favorite guy ever the Super Deserve It Happy Birthday Wishes Card to show him big love on his special day! The bold reds and loud yellows of this card will wish him a fantastically fun-filled day because if anyone deserves it—it’s him! 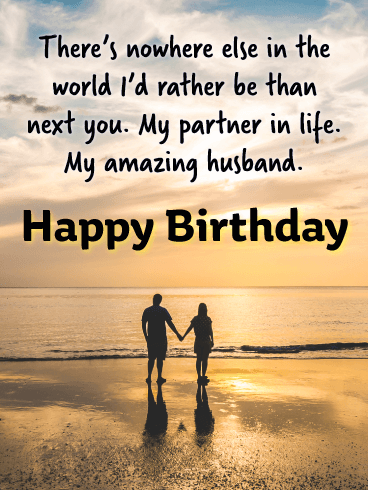 It’s the birthday of someone very special and close to you, your own husband. 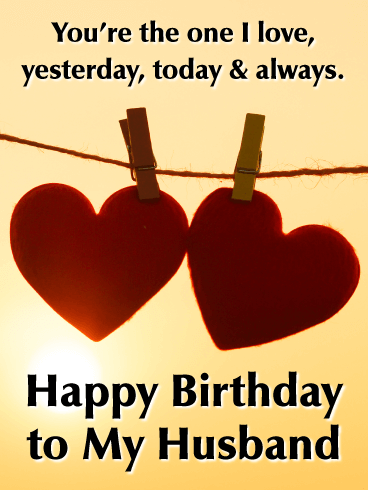 Not just any card will do for your precious boo, so choose the Love You More Each Year Happy Birthday Wishes Card. Featuring a beautiful photo of a couple kissing behind a red heart, this card is very romantic! 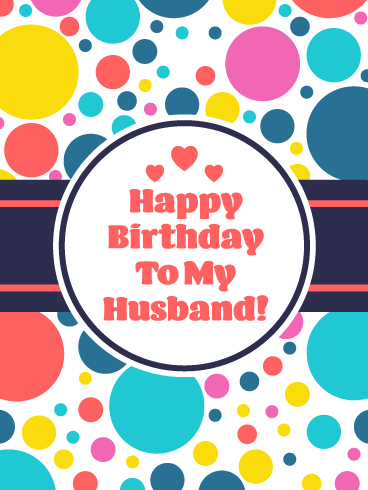 You care for your husband more with each passing year and he needs to be reminded of that love! Does your hubby drip style? Ooze class? Does he grow a beautiful beard or have great hair? Can he rock a bowtie and belt out a tune? 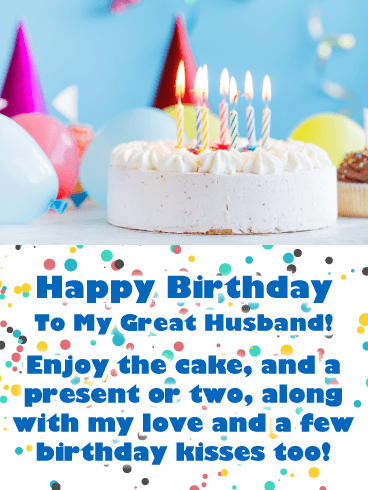 Send that stylish gentleman husband of yours the Stay Classy Happy Birthday Wishes Card to tell him how highly you think of him and wish him yet another year full of good health and even better times! 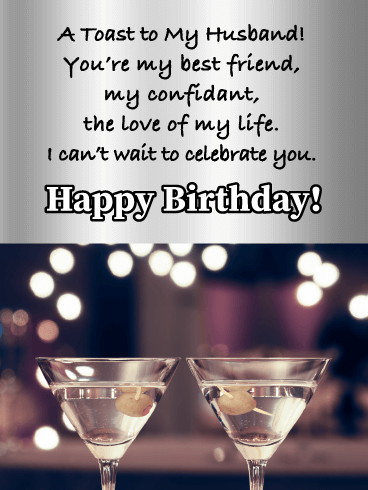 Send the Cheers To You Happy Birthday Wishes Card to none other than the love of your life! 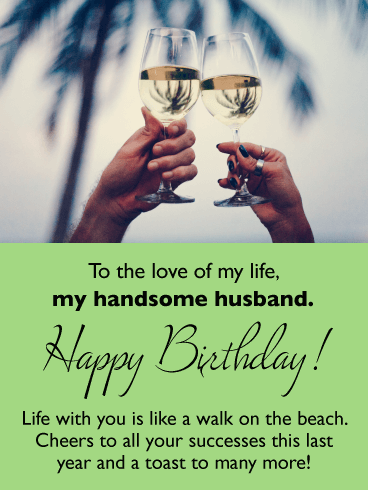 Your gem of a husband deserves this tasteful card of a couple clinking wine glasses at the beach. Let him know how much you love being the one he celebrates all his successes with and that you know he’s in for many more! It’s not that he’s getting older, he’s becoming vintage! Send your amazing husband this classy photo card with its retro green vehicle. 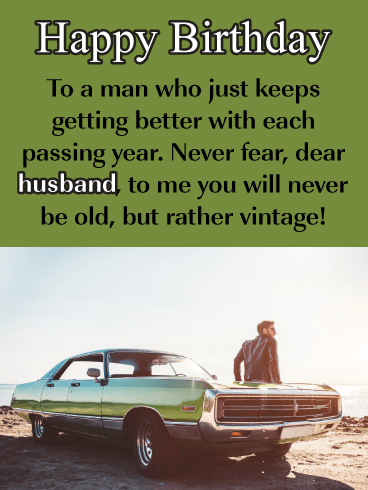 The Vintage Man Happy Birthday Wishes Card will make your fellow feel on top of the world and well-loved on his special day! Let that guy know you truly believe he just keeps getting better with each passing year! 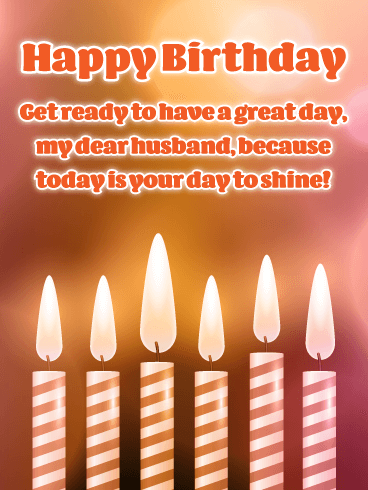 Wish your dear husband a happy birthday with this impressive greeting card! It features fabulous decorative balloons on a wonderful blue pattern background. Creative Happy Birthday lettering is displayed on a great shade of purple! He is going to love this birthday card! Send these fantastic balloons over to your husband without delay so he can enjoy them on his special day! Everyone deserves a special birthday cake on their big day, especially if it is your husband! 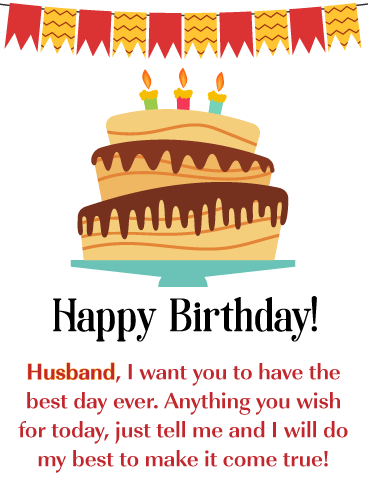 This birthday card will let you send the best birthday cake ever to your husband, complete with lit candles! Balloons and party hats surround this fabulous cake giving it a festive look! Your husband will surely appreciate that you are not only sending your love, but also a few kisses too. Get this cake over to your husband so he can make a wish and blow out the candles! 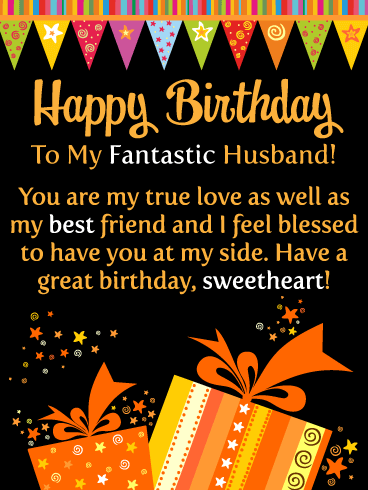 It's your fantastic husband's birthday and that means it's time to send him an exceptional birthday card! This greeting card is filled with colors that pop off the page! It showcases perfectly wrapped birthday gifts and creative streamers. Your husband will be touched when he reads that he is your true love and your best friend. 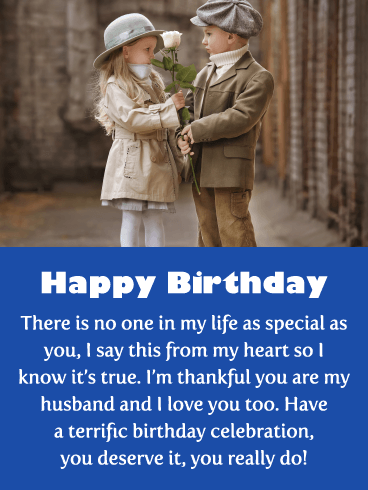 So send your sweetheart this amazing birthday card soon so his birthday will be extra special! 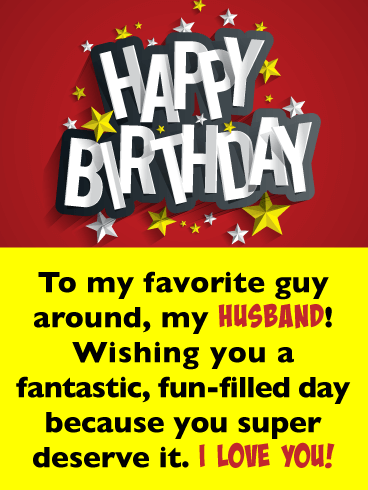 Get the party started with this sensational birthday card that your husband will really enjoy! Who wouldn't be excited about a birthday card that features such impressive looking drinks! 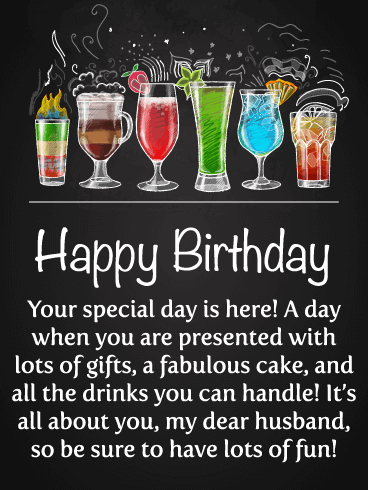 This birthday card will let your husband know that you are wishing him lots of presents, cake, and of course, all these specialty drinks! 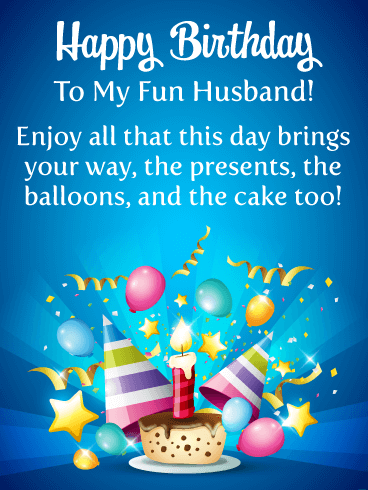 Remind your husband to have lots of fun on his birthday with this amazing greeting card today! 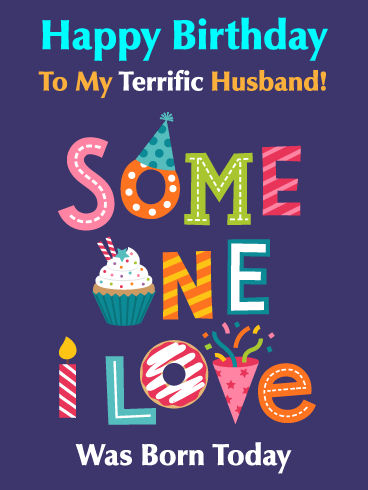 This darling birthday card is going to sweep your husband off his feet! It features a lovely vintage style image of a girl handing a boy a rose. It's a classic picture that makes this birthday card so very special. Your husband will be touched when he reads that there is no one in your life more special than him. So send this cute pair over to your husband to wish him a happy birthday. 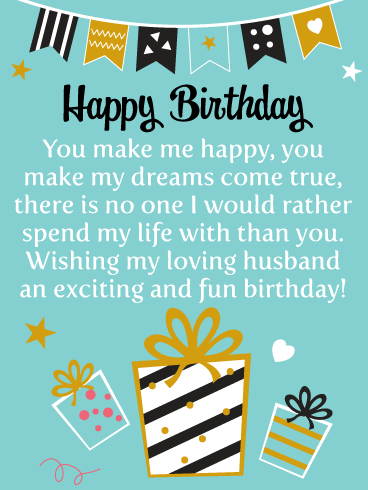 This cheerful birthday card will certainly add joy to your husband's big day. It showcases special heart balloons that add an element of love. 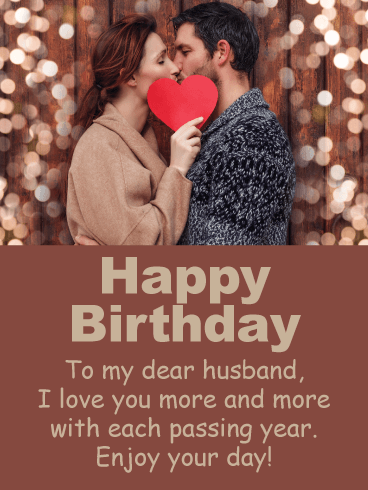 They will remind him that this is not just an ordinary birthday card, it's one that was sent out of love from his wife. 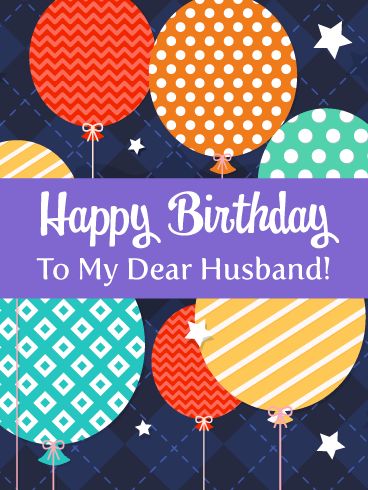 Send these creative balloons to your husband today to remind him to enjoy his special day. 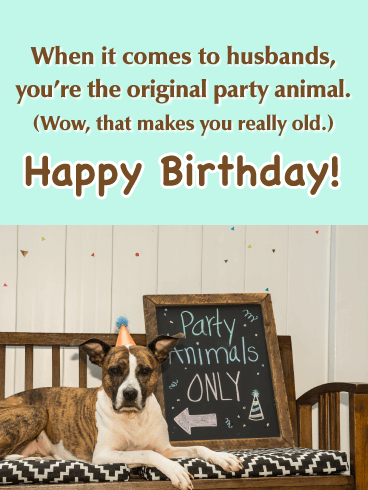 If your Husband loves dogs then he is going to adore this birthday card. It showcases a cute puppy posing with birthday gifts. So special! Better than that is the message that tells your husband that he means more to you then he will ever know. What more could one ask for on their birthday! 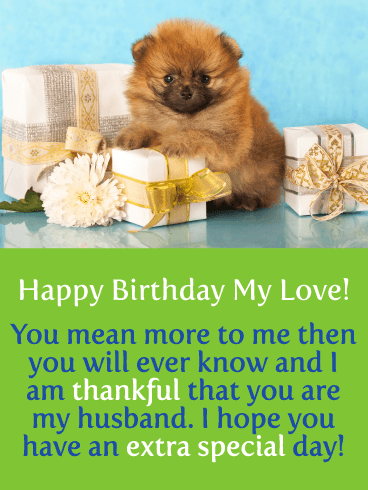 So wish your loving husband an extra special birthday today by getting this puppy over to him right away! 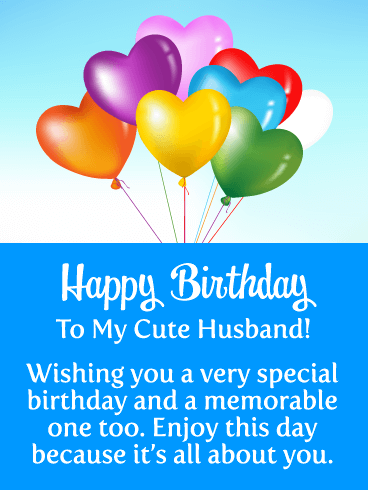 Send this cute birthday card to your husband to make sure he has a very special day! The joyful image will remind him that today is a day to have fun and do whatever he wants to. After all, this day is all about him! The little dog chasing the bubbles will surely put a smile on his face. The lettering that spells out Happy Birthday gives this greeting card an extra splash of color that looks fantastic with the purple and green! 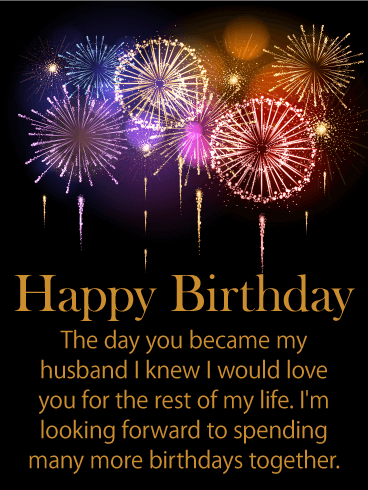 If you are looking for a birthday card that captures the love you feel for your husband, you just found it! This romantic birthday card showcases a loving couple embracing in a beautiful setting. It will surely melt his heart! He will also be touched when he reads that you love him with all your heart. 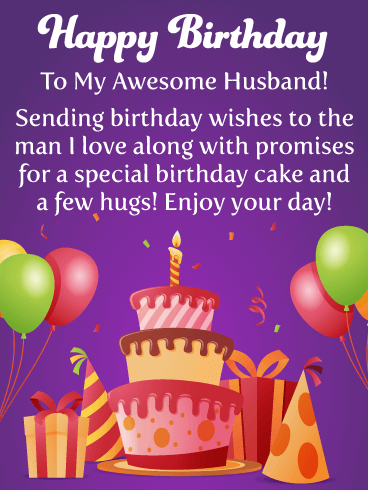 So wish your husband a wonderful birthday with this sensational greeting card today! 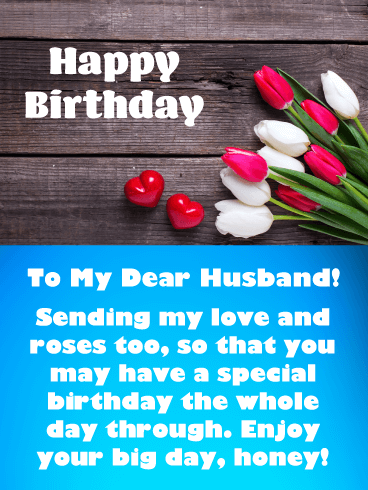 A birthday card for a husband shouldn't just contain the typical birthday greetings, it should include a message of love. This birthday card certainly takes care of that! It features a loving couple having a great day together at the beach. The meaningful message expresses that your husband is the love of your life and that you cherish your time together. This will be the best birthday present he could receive. 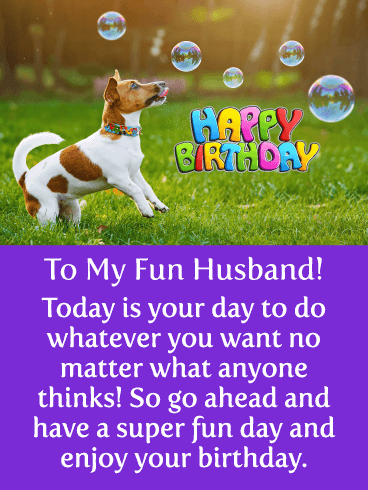 Send this wonderful birthday card to your husband today!